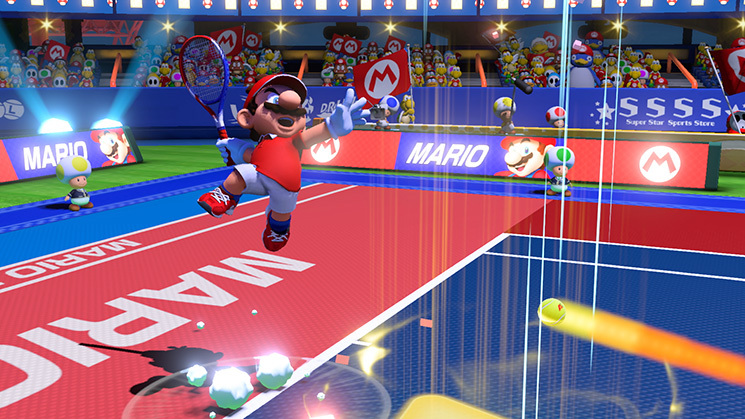 Mario Tennis Aces is the first Mario Tennis game I’ve ever owned–crazy, right? I’ve played many of the Mario Tennis games but it was always at a friend’s house or at a store. 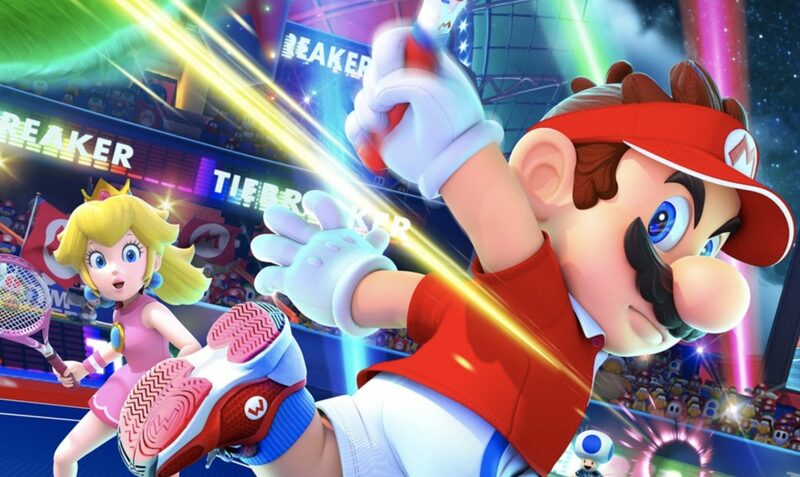 Mario Tennis Aces certainly looked impressive from everything I saw about the game leading up to launch, but I’ve been a little disappointed with it. Aces features a story (“Adventure”) mode which harkens back to the days of Mario Golf and Mario Tennis on the Game Boy Advance. While I was initially really excited about the story mode, it felt a little tacked on and didn’t have as much depth as I was hoping. Players “level up” as they progress but it didn’t feel like that same payoff as leveling up in a typical Pokemon RPG game or even the Mario & Luigi games–I know it’s not trying to be a full, RPG-like experience, but it felt like it was trying too hard to be that. There are also various rackets players can unlock as they progress each with their own strengths and weaknesses. I really liked the design of the wooden racket in particular as it had these cool interlocking gears animating inside the racket head. I’m not sure what I was really expecting with the story mode overall because it did a lot of what I wanted which was to offer some fun non-tennis scenarios/challenges. Each challenge usually works on a particular part of your tennis shots: lob-shots, drop-shots, etc. These diversions from the regular tennis matches were welcome if a bit contrived. While the adventure mode wasn’t as long or as deep as I was hoping, it still does a great job of getting players equipped for playing multiplayer. The gameplay in Mario Tennis Aces feels very good with some minor exceptions. Shots are all executed with different buttons. Top-spin shots (the most typical shot in Tennis) is with the ‘A’ button, the ‘B’ button does a slice, ‘Y’ button does flat shots, and the ‘X’ button has double duty and can be used for Lobs and Drop Shots. Pressing up on the left joystick while pressing ‘X’ does the lob, and pressing down on the left joystick while pressing ‘X’ does the drop shot. Unfortunately, that’s not all the ‘X’ button can do, if you double-tap the ‘X’ button it does a Trick shot, which also happens to be mapped to the right analog stick as well. What’s frustrating about this is when you double-tap ‘A’, ‘B’, or ‘Y’, it does a more powerful version of each of those types of shots. So the game trains you to do that double-tap on each button. As a result, I constantly found myself double-tapping ‘X’ while holding up or down on the left stick and it would do a trick shot. Now, I did find in the options a way to turn off the right analog stick from doing the Trick Shot, but to me, that wasn’t the issue. I never accidentally touched the right stick–it was always the ‘X’ button. That may be a minor thing to some, but that was a big problem in the game for me. And it really underlies a bigger problem in the game: lack of customizations and options. There are very few options in the game–it feels very barebones. Even in matches, you can’t choose the number of sets in a match. It only has ‘Quick Play’ which is basically like a Tennis tiebreaker where it keeps alternating every couple serves and then ‘Extended Play’ which is the typical Tennis scoring (0 or “Love”, 15, 30, Deuce, Advantage) but it only does best of 3 sets with only a few games in each set. I’d really love to have the option to play a full, proper Tennis match. I’m sure that can be added in a future update to the game, but it shouldn’t have to be. I’m fine with new characters being added post-launch and even certain modes, but core options should be there Day 1. The visuals in the game are pretty solid. There are some stages that showcase better than others. Jagged lines on grass and other objects can be jarring at times, but it still has a nice visual presentation in most cases. The game definitely looks the best when played in single-player mode. 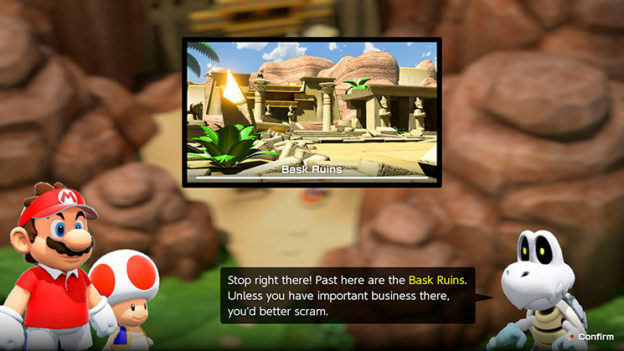 When playing multiplayer or Doubles matches, you can tell details don’t look quite as clean. The game didn’t seem to have any performance hiccups unless there was a bad connection during online play. Speaking of online play, the game features a few options for players. 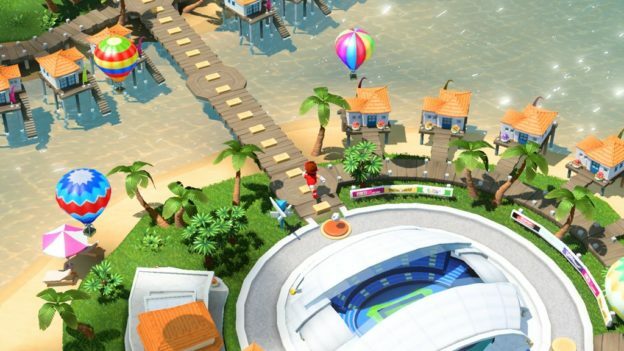 In “Free Play”, players can connect online and play with friends or anyone. You can even have two people on the same system play online with others. There is also an “Online Tournament” mode which is during limited times of the year, similar to Splatoon 2’s Salmon Run mode. Players will also have a wealth of local multiplayer options with up to four players. Aces also includes a Swing Mode which allows for motion control-based gameplay. 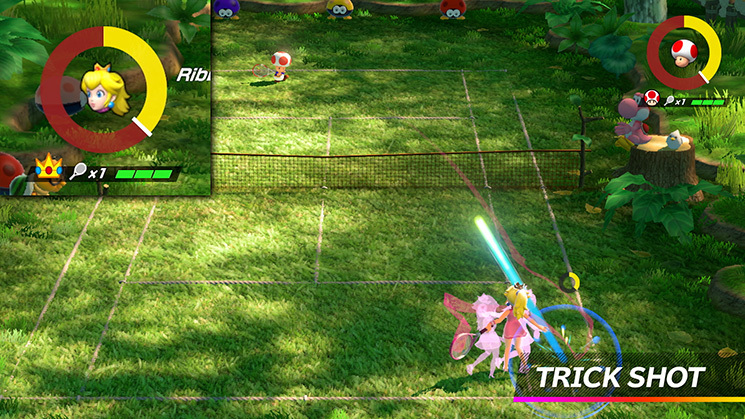 There aren’t any special moves–it’s just basic tennis gameplay, which is totally fine. The Swing Mode isn’t nearly as fun as Wii Sports Tennis, unfortunately. It feels, again, like a tacked on mode that doesn’t have a lot of depth. The motion sensing they use in the game doesn’t really detect forehand vs backhand or even the timing of the swings that well. This was the biggest disappointment to me as someone who loved the motion gameplay of Wii Sports and Wii Sports Resort. If you can’t give us the same great, motion gameplay of Wii Sports Tennis combined with fun Mario characters, just don’t bother. 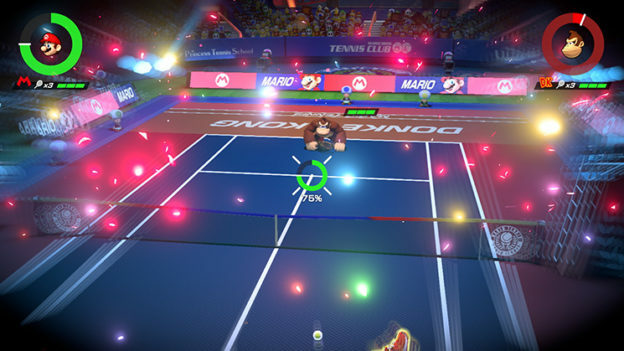 Overall, Mario Tennis Aces is a decent game. It’s not great, but it could be with some tweaks here and there. If you’re looking for a decent new multiplayer game to add to your Switch library, it’s certainly worth a look. Unfortunately, for the content offered, $60 is a bit much. It felt like Nintendo was really trying to stuff in some extra modes to warrant that price tag, but I don’t think it feels like a complete package. Its core gameplay is fun, but I would wait for a sale.